Google just made it super easy to compare device specs. 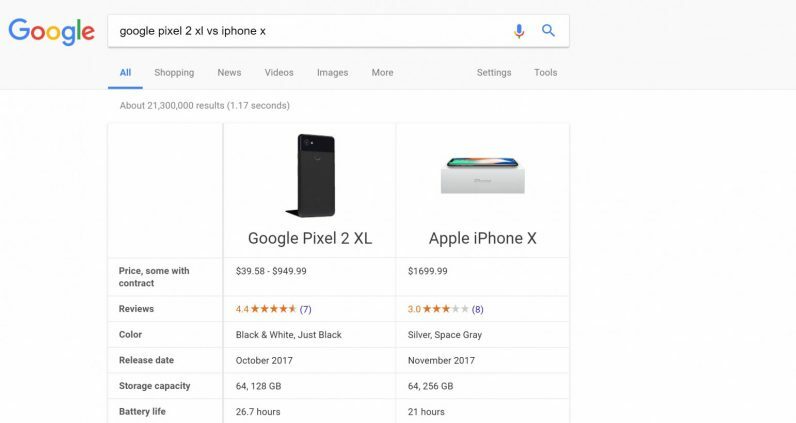 Now, typing something like ‘Google Pixel 2 XL vs iPhone X’ into search will bring up a table comparing specs and customer reviews for various devices. Android Police spotted the change over the weekend. Right now, the feature seems to work best with smartphones. While I get results for other smartphone comparisons like “OnePlus 5 vs Galaxy S8,” I don’t see anything if I type “Surface Pro vs MacBook Pro” and get a comparison, for instance. The comparison currently shows a few rows of basic specs, which you can expand by tapping on the downward arrow for an extensive list of features. The feature seems to have rolled out to most users by now, with several members of the TNW team showing the comparison. It’s a small touch, but a genuine time saver when you want to quickly look up device specs (something I do several times a day). Here’s hoping it expands to other devices soon.